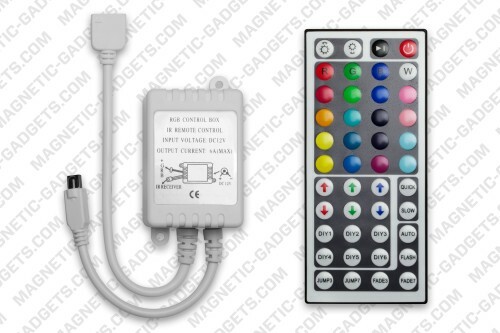 The 44 Key Remote for RGB LED strips offers all the functions of the 24 key remote but has more color modes and options. You can choose from a total of 20 preset colors but the fun doesn’t stop there! The 44 Key remote also features a custom color creation mode. Simply select a color and press one of the 6 custom DYI keys to assign the color to that key. You can then add or remove some Red, Green and Blue to create your very own custom color. Press the DYI key again to save your color.